Scattered about Derek Straub's office — its walls only slightly muffling the screech of the surrounding machine shop — are intriguing artifacts: webbed metallic structures, twisted cylinders made of polymer, aluminum blocks whose cross sections reveal intricate architecture inside. They were built, layer by layer, in the MIT Lincoln Laboratory's additive manufacturing (AM) machines. They were also born of Straub's vision. Straub is the AM lead at Lincoln Laboratory. He's now being internationally recognized for his contributions to the additive manufacturing field. 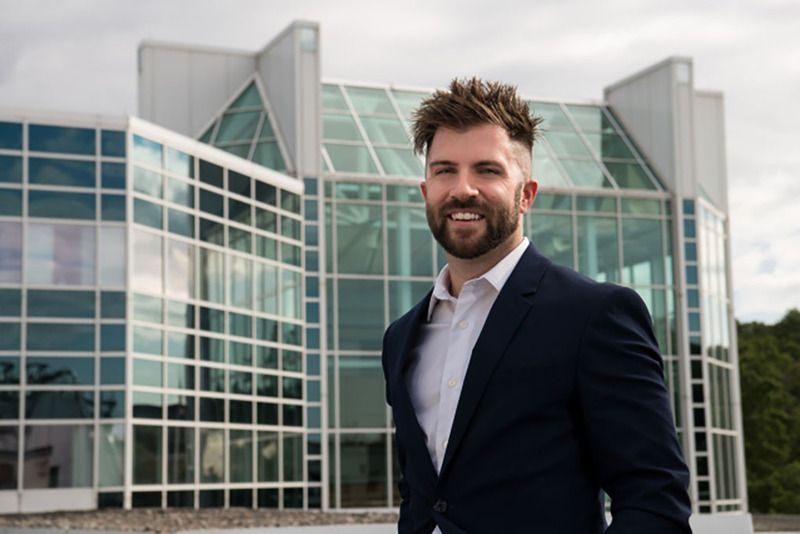 The magazine Manufacturing Engineering, a publication of SME (formally the Society of Manufacturing Engineers), has named Straub among the 30 individuals under the age of 30 who are leading the manufacturing industry into the future. "I feel honored, especially to be recognized alongside so many talented and varied people, CEOs, academic researchers, entrepreneurs," says Straub, who works in the Fabrication Engineering Group. "I think one thing that sets me apart is my exploratory mindset. I take calculated, engineering-based risks to push the edge of what's possible in AM and then, at the laboratory, we quickly apply what we've learned straight into our real-world defense applications." In his seven years at the laboratory, Straub has become the go-to expert for how to design, prototype, and build 3-D-printed parts that are used in systems as diverse as satellites, imaging systems, drones, and breath monitors. He earned a master's of engineering in manufacturing degree at MIT through the Lincoln Scholars Program in 2015. In the shop where he works, Straub points out the array of conventional subtractive machines, which cut or laser away material to produce a final form. In contrast to subtractive processes, AM, as its name suggests, is additive, layering material to build the final form. Straub explained that AM is especially useful for making complex parts, ones that require intricate geometry, curves, or voids that would be difficult or impossible to carve by using subtractive tools. "We can design complex parts that were previously unattainable, but are now actually achievable due to AM," he says. "It's here to stay, but it's not completely replacing subtractive machining; it's just another tool, a very important one." Part of his role as AM lead is to open up engineers' minds to AM designs and the functions they can enable. Last year, 39 percent of hardware programs at the laboratory used AM in some aspect. Straub expects this figure to grow to close to 100 percent in five years. One notable program was a high-energy laser system that was built with 115 additively manufactured parts, more than a quarter of the entire system's components. These parts helped keep the system lightweight and compact, two major program requirements, but also served functional purposes — for example, keeping the system cool and providing structural rigidity. The metal plates that house the system's fiber amplifier were built with flow channels inside, allowing cooling fluid to pass through tunnels following the curves of the hot laser fibers. This AM design would have otherwise been conventionally impossible to machine, Straub says. Jim Ingraham, Straub's former group leader, nominated him for the 30 Under 30 award. "In my six years of working with Derek, I watched a highly creative and technically advanced engineer not only embrace and utilize additive manufacturing technologies but become a leader in the field, developing a variety of previously unattainable integrated multifunctional parts," Ingraham says. While AM is more popularly known as "3-D printing" (a term coined by an MIT professor when machines first used inkjet heads to dispense adhesives to bind layers together), Straub prefers the term additive manufacturing because it is more encompassing of the various industrial techniques in use today. One technique is called selective laser melting (SLM). Through the window on the SLM machine, Straub points out a 10-by-10-inch metal base plate and next to it a bin of aluminum powder. It's deceivingly heavy. "Try lifting a scoop of stainless steel," Straub says. In the manufacturing process, a bar pushes a dusting of powder onto the plate, a laser above the plate melts the powder in specific spots, and the melted metal cools and solidifies. Over and over through this dusting, melting, and cooling dance, the part is produced. The SLM machine is one of nine industrial AM machines that Straub oversees daily. In addition to supervising production, Straub is driving AM research at the laboratory. One area he's excited about is research in composites, like carbon fiber reinforced polymers. "Everyone agrees that composites are amazing, they're lighter, stronger, stiffer, and so on, but they're a nightmare to manufacture," he says. Straub wants to develop advanced AM processes to build composite materials that could be tailored to serve a part's function, for example, by being stiff in one area of the part but flexible in another. Multifunctional parts are also another focus; he envisions, and is already producing, AM structures that have several functions, such as ones embedded with electronics, RF antennas, or heat exchangers. Besides being functional, many of the parts Straub produces also happen to be beautiful. "Many of us engineers think rectilinearly; when we think about support, we think of trusses. But when we give our topology optimization software the constraints, it comes out with this," he says, holding out a small metal object. It's an optical mount, but the mount's supports look like metallic tree branches, crisscrossing and curving organically. "Sometimes nature has the best way figured out already." Nature plays a role in Straub's big picture vision for AM. Can we use what nature provides us to manufacture what we need on the spot? He thinks about NASA's mission to send humans to Mars. "We won't be able to send everything we need; we aren't sending steel," Straub says, "but could we use the actual sand, the soil, the minerals there to additively manufacture buildings and structures?" Similarly, he thinks about military convoys and the lives lost transporting materials to bases. "With AM, we can make thousands of parts with the same tool. It opens up the space to building on demand, on location," Straub says. While Straub is leading AM into the future, he's also sharing what he's learned with the next generation. At the MIT Beaver Works Summer Institute in August, Straub and his colleagues developed a new unit that taught kids to hack a 3-D printer to do something new with it. The boom of commercial 3-D printers has kids enthusiastic about and familiar with the technology. This enthusiasm will only help fuel what Straub sees as an inevitably growing industry. "AM is a game changer," he says. "It is greatly impacting the world and it's enabling new programs at Lincoln Laboratory. The only thing holding us back currently is our minds."